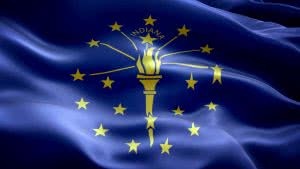 Indiana is a US state, admitted to the United States as the 19th on December 11, 1816. It is located in the midwestern and Great Lakes regions of North America. Indiana is the 38th largest by area and the 15th most populous of the 50 United States. Indiana is the least extensive state in the continental US west of the Appalachian Mountains. Its capital and largest city is Indianapolis, the second largest of any state capital and largest state capital east of the Mississippi River. Name of Indiana corporation must be distinguishable from the name of with any existing entity, reserved, registered or fictitious names. Company Express will research your company name to make sure it meets Indiana’s standards. Turnaround time: 3-5 business days. Time to file: Biennial Business Entity Report must be filed before end of the month that marks the anniversary of incorporation. The state fee for this report is $30. Name of Indiana Limited Liability Company must be distinguishable from the name of any existing entity, fictitious, reserved or registered names. Company Express will research your company name to make sure it meets Indiana’s standards. Time to file: LLCs must file biennial reports before end of the month that marks the anniversary of incorporation. The state fee for this report is $30.